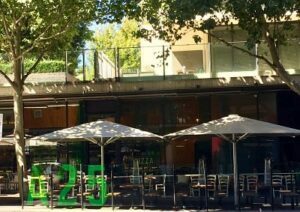 A25 Pizzeria has recently been accredited by Coeliac Australia and there are three locations to get gluten free pizza in Melbourne: South Yarra, Melbourne CBD and Docklands. Pizza is obviously a big focus on the menu, with a huge variety of toppings and gluten free bases available at extra cost ($3 at South Yarra and CBD stores and $4.5 at Docklands). 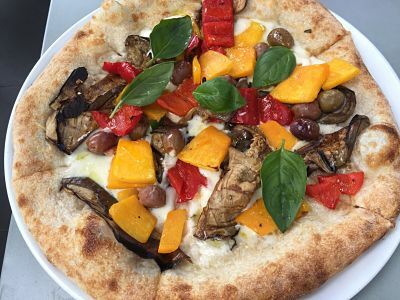 The menus vary slightly between stores, but as well as pizza, there are other traditional Italian offerings such as pasta, caprese salad and desserts, all of which have gluten free options. On ordering, it was noted that I was a coeliac and was assured that precautions were in place to avoid cross contamination. I chose the special pizza, which turned out be one of the nicest pizzas I’ve ever had! 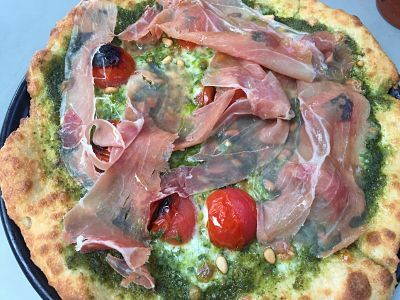 It was pesto, prosciutto, tomato and pine nuts and the flavours and textures just worked. My friend had the Veggie Explosion on a normal base and she enjoyed that too. She added some chilli sauce that was at the table and found it was really hot, so just add a little at a time to get to the right level of heat for you! The gluten free pizza came on a tray and the normal pizza came on a plate so that indicated some differences in cooking process. 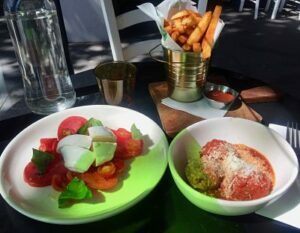 I have also enjoyed the entree of wagyu beef meatballs with Napoli sauce (pictured bottom right below) which melted in my mouth and a serve of three meatballs was very filling (you can also order five!). The Italian chilli fries were incredibly ‘more-ish’ and the caprese salad was light and refreshing. I haven’t had room for dessert as yet, but there is cannoli, sweet pizza, and ice-cream (including a vegan option). The city store is at the Lonsdale Street end of Hardware Lane and has outside seating in the laneway which is a nice spot on a lovely day. The Docklands restaurant is located under the Myer headquarters and is quite a big restaurant that can get pretty noisy inside. It has some outside seating on a side road which is opposite a park, so it is a a really pleasant place to sit outside in the city. It is walking distance to Marvel Stadium so great if you are going to the footy on a Friday night! 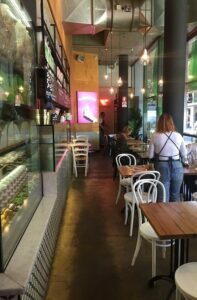 The South Yarra store is on Chapel Street, just down from the COMO centre, so a convenient option if you are shopping or seeing a movie along Chapel Street. The restaurant here is quite small inside, but there are a lot of outside tables. All stores have the facility to order online for delivery via Uber Eats and Deliveroo. 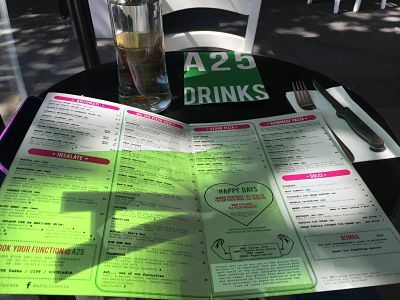 A25 Pizzeria is a fantastic addition to the gluten free Melbourne scene and I’m looking forward to trying more menu options out! Parking is available in the nearby shopping centre (Woolworths, Big W etc) and if you do some shopping there you can get reduced parking costs.